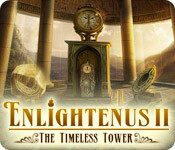 Enlightenus II: The Timeless Tower is rated 4.0 out of 5 by 23. Rated 5 out of 5 by pennmom36 from Enlightenus II: The Timeless Tower Another fantastic trip to Enlightenus! Clarence Flatt is a well respected Clock Maker, whose nearing the end of his life and has asked you to find the legendary Timeless Tower. Clarence has been working on a broken perpetual timepiece that collapsed and scattered throughout pivotal times of his life and your journalistic skills are needed to enter several clock portals to recover key fragments to enter Enlightenus and restore his life achievements! I was so happy that this edition continued with the Hidden Object Scenes requiring you to replace items back into the scene. 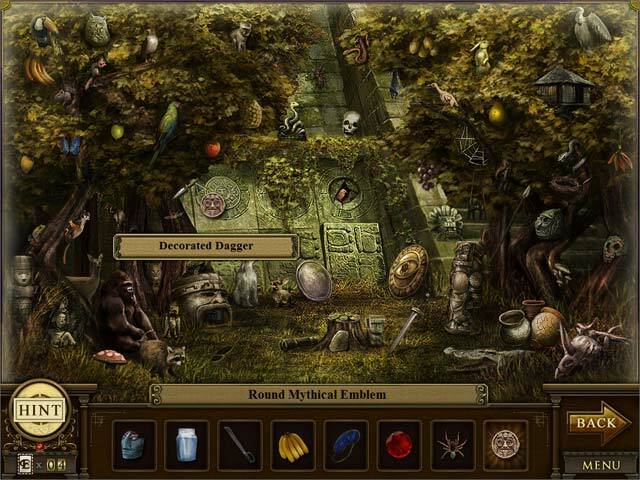 This isn't an easy task by any means because the scenes are jammed packed full of random items, the only way to find out what the items are is to pick up the item from the inventory bar and drag the item to each object in the scene which is labeled and the tag will only appear when you have the item picked up. They aren't normal labels, they may say thirsty gorilla or one eyed statue or dirty mirror, so you have to figure out what the item is called in order to place the inventory item correctly. 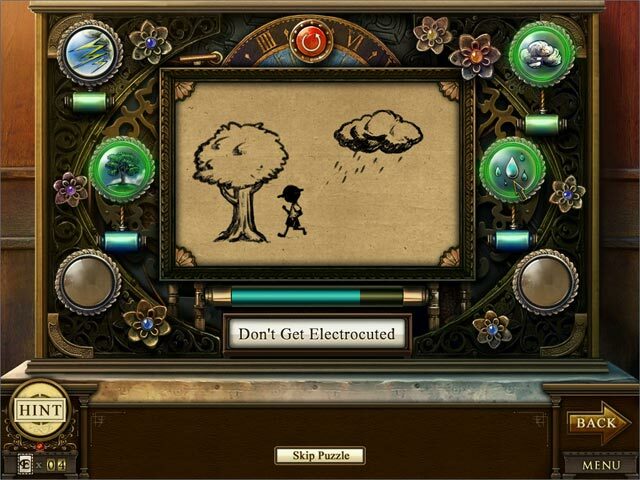 You can collect hidden Enlightenus Cards within the HOP's that can be used to speed up the Hint system recharge time. The Mini Games are all the same, interactive drawings where you have to select the correct additions to be added to the drawings to achieve the final description. For example the caption may say "Don't get Electrocuted" with just a drawing of a boy on a blank page. First you have to click on a tree which appears on the page next to the boy, then you click on the cloud, then rain which makes the boy run under the tree to keep from getting wet, and finally the lightning which will strike the boy if you choose the options in any other order! Enlightenus is one of the most unusual and entertaining games I have played in a very long time. If you don't like games with a ton of HOP's, then pass this series by, because every location has a Hidden Object game within the Clock Portals such as the Forbidden City 1850 A.D, Medieval Castle A.D, Ancient Egypt 1000 B.C and even the Ancient Mayan, enjoy! Rated 5 out of 5 by mrm2006 from I have become enlightened .... and I LOVE IT! After playing the first game of Enlightenus, I was so confused I wasn't sure I wanted to tackle this one. But, being optimistic as I am, try it I did and am very glad of it. Storyline: Clarence Flatt, a well-know clockmaker has asked that you visit him in the hospital. There he tells you about the Ageless Clock he has been working on. Unfortunately, while working on a mechanism, things went awry and clock pieces are everywhere in the tower. You must go throughout the tower and find all the necessary pieces to complete the Ageless Clock. Are you up to the task? You meet his hologram in the first instances of the game, get instructions and are promised the story of a lifetime. Off you go. Graphics: Although still on the dark and dreary side, the graphics have improved with more color and less monochromatic color schemes. However, items in HOGs are still impossibly tiny. Sound: Background music soft and relaxing. No side effects to speak of. Game Play: In order to find the pieces of the Ageless Clock you must go through the tower and enter different time periods, play an HOG, get a button and move on to a mini game now and then. Period - that's all you do. HOGs: Not your run-of-the-mill HOGs. As in the first Enlightenus story, you have to put items BACK into the picture. However, as in the first game, someone has a sense of humor because some of the items are slightly off-track, like a musical squirrel. You may also have to use several items before you complete something - for instance, give the comb to the Princess with the frazzled long hair, then give her scissors to cut her hair. You've now disposed of 2 items. Mini Games: Not many that I came across. All needed thought behind it. Explanations and instructions thought sometimes vague were better than the first game, which gave no instructions at all. You could skip the game but it would cost you several of the dear "E" cards. I finally found out what the "E" cards are for. They don't represent a "number" of hints you receive, but rather, if you click on an "E" card in your possession (by the hint button), it will cause the hint to recharge much more quickly. A good use since normally the hint button takes several minute - long minutes - to recharge. There are 2 E cards in every HOG. Impossible to find. I only got mine by happenstance. This Glam-ma was actually intrigued by this game. Much more so than the original. And, if not for the horrible lag time between EVERYTHING you do, I would purchase it in a New York minute - lol. Who knows, maybe sometime in the future, I'll have a hankering to revisit this game. I encourage everyone, especially those who liked the original game, to try the demo. It's only an hour - a very quick hour - and it is free. I think you will enjoy this version of the game much more than the previous one. Happy Gaming to All! Rated 5 out of 5 by Sitara33 from Fell in love I loved this game. It was challenging as well as fun looking for the next clue and clock piece. Rated 5 out of 5 by tesamoine from Wonderful Game I just found out there was a Part II to Enlightenus. Oh happy day :) I absolutely loved the first in the series, and also love this one. It is so unique and different than really any game out there. 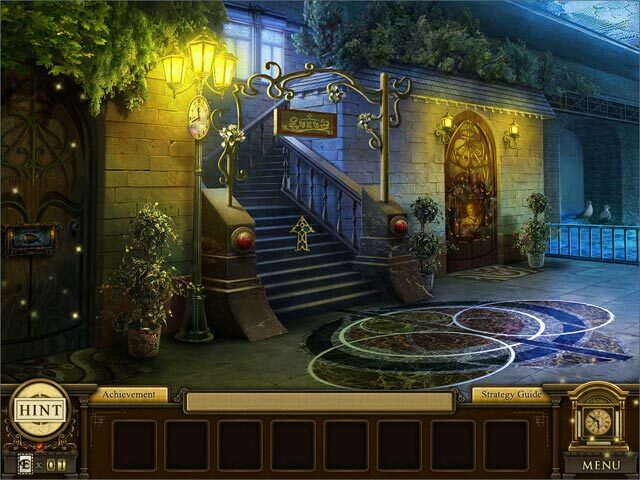 The level of challenge is high as far as the puzzles and adventure part of the game go. You really do need to think about where to place the objects back into scenes. Some are hysterical. I see they're making a part 3 and will eagerly wait for that one. I highly recommend this game. Rated 5 out of 5 by gamefan10 from Great game! The story line is that you are a reporter and you're trying to reconstruct your grandfather's time clock. There are 7 floors to the Timeless Tower, and each floor has about 9 scenes. This is kind of the opposite of a hidden object game - you have to place objects where they belong in the scenes, and they don't always go where you think they're supposed to go. There is some humor involved when you finally find where to place some of the objects. At the end of each scene you're given a circle. There are also objects lying around each of the floors, and you need these to finish all the objectives on each floor. At the end of each floor you have to decide how to organize the 9 different circles you've gathered, and when you finally get them in the right order a hidden shelf opens and you get an object that will open the door to the next floor. The length of this game is very good, not too short or too long. The artwork is good, and objects are usually easy to see. The only things that are very hard to find are the two E cards in each scene. When you find and use these, they will help the hint button to recharge very quickly. But they are very well hidden! I really enjoyed playing this game and highly recommend it. Rated 5 out of 5 by nospaceleft from Thoropughly enjoyable but hard on the eyes... I won't attempt to explain the gameplay here...others have explained quite well the process and storyline (or lack of it). I think this is the second game in this fashion, and I liked the first one also. I really enjoy the ways this game differs from the normal HOG. Sometimes the objects were too easy to spot, but sometimes they were quite beyond me!! I found myself thankful for the repeat screens because it was difficult for me to read the descriptions while trying to remember the logic while hunting for the stupid tiny E cards!! I came to really hate those E Cards...They are so very tiny!!! Once I gave up hunting too hard for the cards, the game became much more enjoyable and less frustrating. Overall I like the differences from so many other games and will purchase another if the devs come up with a new one. Rated 5 out of 5 by grammakk from wonderful sequel i know this is an older game been meaning to get it.what a wonderful relaxing game and i felt so sad at the end first time a game has done that.great storyline,wonderful colorful graphics.dont miss this one if you played the first. Rated 5 out of 5 by rosekaufmann from IMPRESSIVE AND POLISHED GAME The main character of Enlightenus is now a city news reporter on the heels of a big news story promised by Clarence Platt provided she finds the scattered pieces of his collapsed Ageless Clock. Very polished production. Stunningly detailed artwork (some scenes are from the Getty), lovely relaxing music, creative and cohesive storyline, very pleasant narration, good length (took me over 6 hours in a slow-paced casual mode). Gameplay: There are a lot of environments, each visited several times. Find an object (usually in plain sight) and use it to expose new clock pieces or open new areas. Instead of the usual HOS, all scenes are reverse HOS. Pick up an object and hover over the scene to get descriptions of every item in the scene until you find an appropriate place for the object. It requires some patience. Some placements are apparent [ex: carving knife on the unsliced roast beef.] Others are not so obvious [Examples: the tiny rapier is for the tiny “defenseless mouse” and the delicious peach goes to the “peach loving baboon" and not on the peach tree.] Once placed, the objects remain in the scene the next time you visit. Your reward is an engraved token button which is put into a schematic for each of the 6 floors. [The higher you go, the more buttons you will collect to complete the floor.] Puzzles are well designed and fun. Some are very unique. My favorite is animating the pencil sketches to perform an action, like “save the grandma” or “catch the big fish.” You are given 5 or 6 actions which you must execute order to achieve the desired feat. You can either try to figure out the steps logically or exercise your memory using the trial and error method. Hints are specific, but slow charging. You can speed up the recharge time by finding and using e-cards, found in each scene. They are extremely well hidden. Overall, this game is as impressive, well designed and polished as the first Enlightenus. The ending is not only satisfactory, but heart-warming. If Blue Tea puts as much thought and work into the next sequel (and I would expect nothing less), I’ll be among the first buying it. Rated 5 out of 5 by LunarBean from Fun Game With a Twist I absolutely love the Enlightenus series. Instead of just finding hidden objects, it's more of an association game of matching objects together in scenes. It's unique, creative, and a nice change of pace. Cool storyline and smooth gameplay. You can excercise your noodle in a way that it has not yet grown accustomed to. May not be everyone's cup of tea, but I really enjoyed it and highly recommend both games in the series. Rated 5 out of 5 by cleep100 from Fun and Different It you're like me and have gotten tired of traditional HIdden Object and Puzzle games, give this one a try. Very cleverly done and requires more creative thinking than just finding something that's hidden. Not a lot of back-and-forthing, which is an additional plus. I liked everything about it.